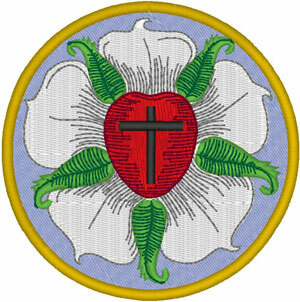 The symbolism of the elements in the design of the Luther Rose or Luther Seal came directly from Dr. Martin Luther. A black cross is set in a red heart. The cross reminds us that faith in the crucified saves us. Even though the cross is black it does not change the color of the heart. It does not kill the heart. The black cross actually keeps the heart alive by faith in the crucified, faith in the Saviour. The heart is in the center of a white rose, symbolizing that faith causes joy, consolation and peace. White is the ideal color of all angels and blessed spirits. The rose is on a sky-colored background, to indicate that joy of faith in the spirit is but an earnest yearning and beginning of heavenly joy to come. Around the seal is a golden ring, signifying that bliss in heaven is endless, and more precious than all earthly joys and treasures. The sewn out size is 3.19" W x 3.22" H with 21,847 stitches.